Unless you have been living under a rock for the last month, surely you have been aware of the mind-boggling stupidity that seems to becoming the norm at Yellowstone National Park. From placing baby bison in trunks, to almost getting trampled by an elk for trying to get a closer photo, the head-scratching actions of some boiled over last month when a group of Canadian filmmakers trampled Yellowstone’s Grand Prismatic Spring and wanted us to work to make it right. It seems people haven’t learned from their mistake, as just this week, Colin Nathaniel Scott, 23, of Portland, Oregon is presumed dead after venturing off the assigned boardwalk and falling into a high-temperature, acidic spring in Yellowstone National Park. And then, new video has emerged showing a group of six following the same route as the Canadian filmmakers, leaving the boardwalk and trampling the Grand Prismatic Spring. While KBZK doesn’t mention the date this was filmed, they do claim it was after the High on Life crew’s stunt a month ago. The sad truth is tourists will continue to disobey laws that were not only created to preserve nature, but also to keep visitors safe, until the punishments for these crimes are both increased and actually prosecuted. If this incident did indeed take place after the worldwide outrage last month, the very last thing a park ranger should be doing to this group of six is “escorting them out of the park”, according to KBZK. Why was this group was not ticketed, prosecuted and eventually required to face their day in court? They got away with a very serious offense with nothing but a slap on the wrist. Until the laws are actually enforced, people will continue trampling on fragile lands, appraching wildlife, and petting adult bison, like the gentleman in the video below. 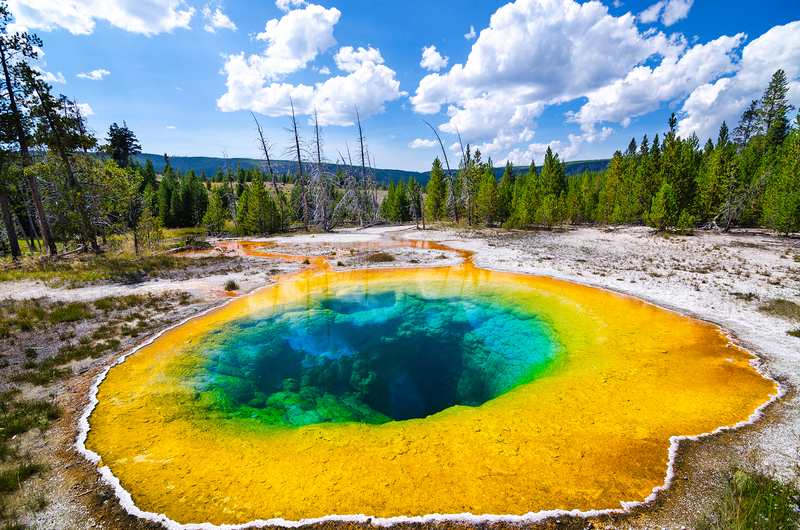 Taylor Gray was somehow able to get an amazing photo of the Morning Glory Pool in Yellowstone National Park without leaving the designated trails.